Boat Trailer Accessories | Boat Trailer Winch Stands & Post | VE-VE Inc. NOTE: These Winch Stands are QUALITY AMERICAN MADE Products, and you DO get what you pay for! 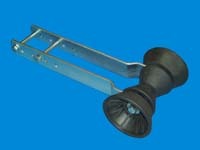 The T-992; Winch Post Assembly is 2" Sq. x 26” long, angles back 23 degrees and suitable for most small water craft & PWC trailers. Winch post has holes drilled in it to allow for 4 winch mount height settings, and comes with adjustable bow roller stop. The T-990; Winch Stand is 3" Sq. x 1/8" thick wall x 29” long, angles back 23 degrees and all parts are constructed of heavy gauge material. Adjustable (Up & Down) winch mount arm and bow roller stop (3 angels). The T-993-G; Heavy Duty Winch Stand is 40” long, angles back 23 degrees and constructed of 3" Sq. x 3/16" thick tubing . 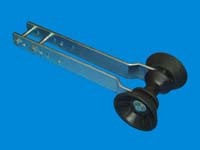 Adjustable (Up & Down) winch mount arm and bow roller stop (3 angels). STANDARD FINISH IS "HOT DIPPED GALVANIZED"
Click on "DETAILS" for more product pictures & Information.